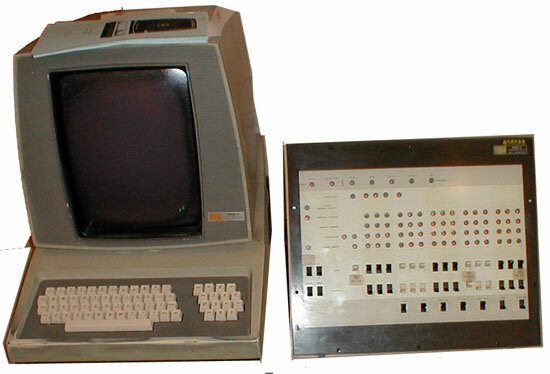 The amazing Imlac PDS-1 minicomputer (see the photo bellow), made by Imlac Corporation (founded in 1968) of Needham, Massachusetts, debuted in 1970 and was the first personal graphics computer. It has a 16 bit main processor with a secondary built-in vector graphics display list processor (which is controlling the display screen), both sharing the same core RAM memory of 4096 16-bit words (see the technical manual of Imlac PDS-1). PDS-1 comprises a operators console (which include a 14 inch CRT display screen and a keyboard) and a processing unit (CPU). It has also an optional compact control console (on the right side of the photo), which provides the operator a means of controlling the CPU directly. The display is capable of displaying about 1200 characters or 500/800 inches of graphics or combination of characters and graphics, and may be oriented in either the vertical or horizontal direction. The PDS-1 used a vector display processor for displaying vector graphics as opposed to the raster graphics of modern computer displays. The PDS-1 was used in many pioneering computer applications. It was often used with another flagship Imlac product, a typesetting program, called CES. The FRESS hypertext system had enhanced capability and usability if accessed from a PDS-1 system. The user could make hyperlinks with a light pen and create them simply with a couple of keystrokes. Multi-window editing on FRESS was also possible when using the PDS-1. The PDS-1 also had the capability to run remote graphical programs such as those that ran on the Stanford AI Lab's main computer. The PDS-1 was also able to run the first online multiplayer computer game, called Mazewar. The PDS-1 connected to a host PDP-10 computer (located at MIT) running ITS over Arpanet and the Mazewar program. Up to 8 players running PDS-1 minicomputers or other terminals could access MIT's Mazewar host. Legend has it that, at one point during that period, MazeWar was banned by DARPA from the ArpaNet, because half of all the packets in a given month were MazeWar packets flying between Stanford and MIT:-) The PDS-1 was also important during the early days of Arpanet when network graphics protocols were under consideration. Imlac PDS-1 was programmed in assembly language (see the PDS-1 Programming Guide). It had a sort of precursor to the pointing devices and the mouse, as we know it today, so called light pen. Instead of moving around a little round object and pressing a button, one would point at the screen with a light pen and press a pedal (not very convenient, yeah?). Either way, the Imlac PDS-1 seems like a computer such ahead of its time that it's quite surprising! Vector graphics throughout its assembly-based operating system, a precursor to the GUI, photosetting, and rather small compared to the sizes of computers in that time. It was really an amazing machine.